When we first moved down here, we brought along with us two scraggly little lavender plants. They were so small and insignificant that we planted them together, side by side, in front of the house. Four years later, they have cascaded down the hill, a formidable hedge of silver and purple. Ali doesn’t like to make wide paths, and with the lavender asserting itself in spite of being cut back rather severely, we now have to lean into it in order to walk down the path into the garden. This results in heady perfume, and finally my mother came to the only possible conclusion — we had to make a lavender cake. I was going through a moment of butter fatigue, so we found an olive oil cake recipe on Saveur magazine’s website and adapted it to our needs. 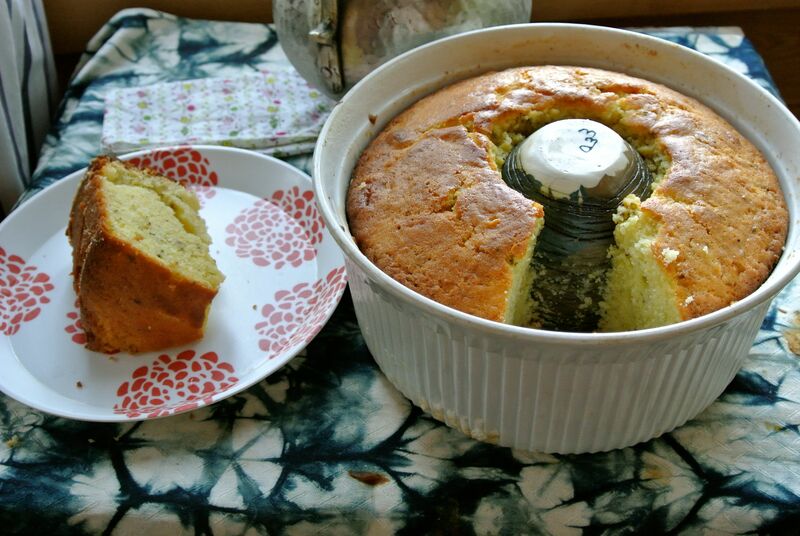 I used a souffle dish with a ceramic cup in the middle, but a bundt pan would also be fine. Heat your oven to 325 F. Butter and flour your cake pan. If you are using a cup, butter the outside of that as well. Beat the eggs and sugar until pale yellow, about 1 minute. Add the flour, oil, milk, and lavender and stir to mix. Add the baking powder and mix again. Pour into your pan, with a finger on the cup to keep it from shifting (and use a heavy cup — I tried with a stainless steel one and it wandered during the baking). It’s a lovely cake that really tastes like lavender through and through. It’s a bit on the dry side, not a gooey thing, so it’s just right with a nice cup of tea. I call it fill in the blank cake because it converts very handily into any kind of cake you like. I will be posting some variations in weeks to come, in which I have used this cake to recycle some by-products of making beverages! I can just imagine the aroma in your house when this cake was baking. If I were your neighbour I would be knocking on your door. I can’t believe that I forgot to mention it. Yes, you’re right the smell is gorgeous. And everyone is welcome to a slice! I’m glad to hear that there will be a lemongrass revival at your place! I’ll have to bake a lavender cake in the flat in the city to scent it when we go back for the new school term. I applaud bakes like yourself who can take a basic cake recipe and convert it to suit their tastes. When it comes to baking, I must stick to a recipe or I end up with a mess in a pan. How nice it must be to have so much lavender in the front of your home. I bet it looks and smells just incredible! I have to admit that it was a sort of cherished fantasy of mine to have a stout lavender hedge in front of the house. It’s one of the great pleasures of having a garden that we were able to make it a reality. Lavender is high on the list of reasons Why I Garden…my ex-husband once admitted that he used run over the tiniest edge of it with the mower, just to smell it. Love your recipe…I’m all out of lavener flowers this year – have you ever used the leaves instead? It’s funny that you should mention Why You Garden, because I found myself standing over the sink yesterday eating a fresh tomato sandwich, having a very similar thought. I’ll have to try using lavender leaves- they’re just as fragrant after all. This sounds like a wonderful cake recipe to have on hand! It’s a great catch-all for tasty odds and ends! Your cake looks delicious! I love simple cakes like this, but I’ve never thought of making one with lavender. I’ll have to give it a try. I wasn’t sure I’d like it, but it’s a lovely flavor. I always feel prepared, knowing that I have a cake ready to catch tasty odds and ends. I use the flower buds, but I am going to try with leaves. I think the flowers might be more tender, but the leaves are just as fragrant so they ought to work. Would you be able to use dry Lavender? or does it have to be fresh? It is a bit cold to grow lavender were I live but I just love the smell. I bought a jar of lavender as a spice but have never used it and would love to be able to. Dried lavender should work fine! It might actually be a bit more intense in flavour that way. So it’s time to crack open that jar of lavender!